This range of modern designer reception desks is centred around the feature light box which not only provides a focal point for the reception area but also provides an excellent space to highlight logos, trademarks or other signage. The front panel of the reception desk is back lit and offered in seven acrylic colours. Receptions areas that look professional whether it be modern or traditional appeal, can really help to increase the companies reputation. This statement might sound far fetched, but when you think that the reception area is the first impression that is given to the visitor about your company, you may not think it sounds that unbelievable after all. 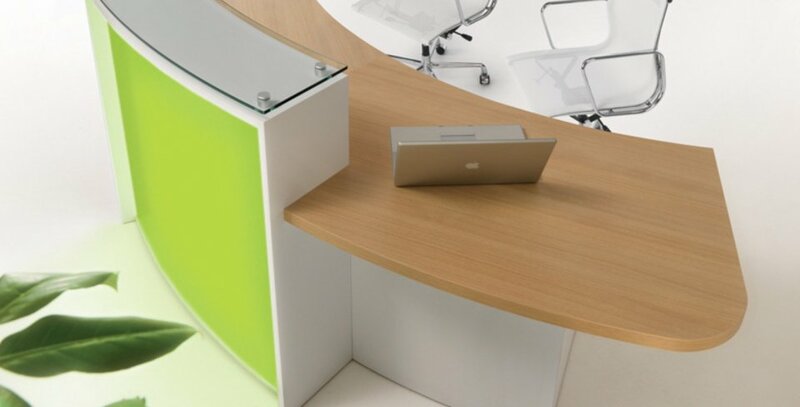 There are many different types of reception desk and they are made from a range of different materials as well. The Evo Light range features a 38mm thick desktop with matching or contrasting edge profile. The light box that the desk has been made around is finished in 7 colours including Yellow, Red, Blue, Orange or White and made from acrylic. Designed to appeal and be a great positive addition to any office reception environment, these reception desks are not modular, they have a wide variety of shapes and stand alone desks that are available in single person or two person options depending on your personal preference. These receptions are truly stunning and an individual reception desk can be created at a fraction of the cost of a bespoke alternative. Having said this there is some scope on these reception desks to customise the front acrylic panel to include a company logo making the desk unique to you. This can be done at a small extra cost and can really add a touch of professionalism and idendity to your reception area. We at Office and Online Reality can provide a free design service that will help you to plan your reception area and we will provide 3D images of what your reception will look like before you have even purchased a thing, If you would like to take advantage of this expert service then please call 01823 663 880 for more details.